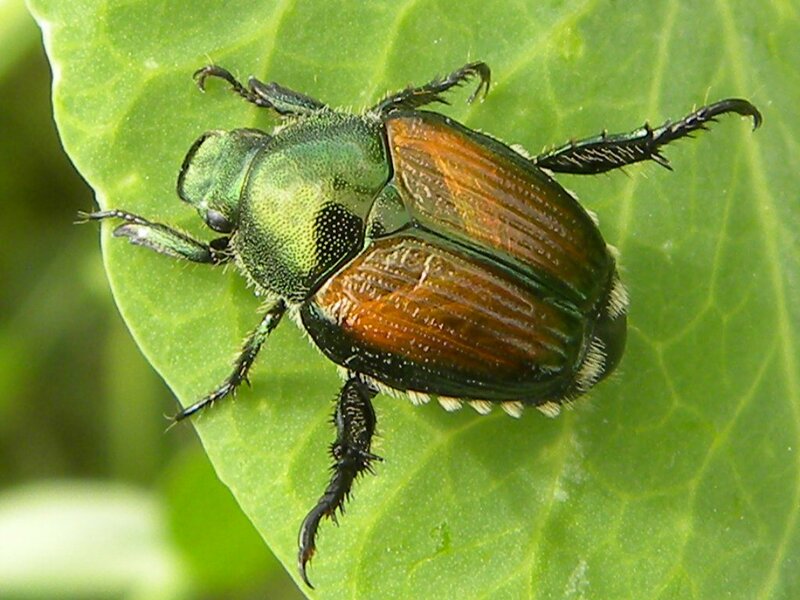 The Japanese beetle, Popillia japonica, is a scarab beetle about 3/8“ long. The head and thorax are metallic green and the elytra (outer wing covers) are copper-colored. Adult feeding damage appears as lacey leaves. The Japanese beetle feeds on over 400 plants including rose, raspberry, bean, grape and blueberry. The adults are good fliers and can move from one area to another in large swarms. When threatened, adults will feign death, dropping from the plant. The larval stage is a C-shaped white grub similar in appearance to the June beetle, rose chafer and European chafer. Japanese beetle grubs can be a major turf pest. A good indicator of a white grub infestation is skunks and crows digging up the lawn. White grub treatment threshold is typically 8-10 grubs per square foot. Japanese beetles usually emerge in the beginning of July and can be found through September. After mating, the females lay eggs in turf. The eggs hatch and the young white grubs feed from late July and early August until the first hard frosts of fall drive them deeper into the soil. After hibernating through the winter, the grubs migrate into the turf root zone to feed again in May and June. Around mid-June, the grubs pupate, eventually emerging as adults in one to three weeks. Managing adult Japanese beetles is challenging because of the large numbers that can occur throughout the summer. A combination of approaches is suggested. Consistent handpicking of the adults can help protect your plants from ravages of this pest. A coffee can, about a third full of soapy water, can be used to collect the beetles. Although controversial, you may want to consider pheromone/bait traps as part of your management strategy. Be sure to place traps at least 50 feet away from the plants you want to protect. Also, do not wait for the trap bags to completely fill before emptying. Poorly maintained traps can be a liability instead of a help. In spite of some evidence that they may draw in more beetles than would normally be present, some gardeners have reported positive results with the traps. Protective barriers (e.g. spun-bonded material) can be used to protect susceptible plants during massive influxes of beetles. Foliage can be protected with sprays of pyrethrins, neem, Kaolin clay (Surround), cyfluthrin/imidacloprid, malathion, or carbaryl (Sevin). Repeat applications, if permitted by the label, are often necessary for protecting plants from this pest. Japanese beetle white grub management efforts are most effective when control agents are in place when the white grubs are small and feeding in the turf root zone. In New England, beneficial nematodes (best application time: last three weeks of August) have been shown to be somewhat effective in managing white grubs. Milky spore has given spotty results and is not recommended. 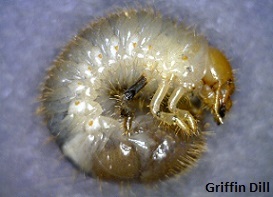 White grub insecticides, such as chlorantraniliprole (GrubEx1), most effective when applied mid-April through May, imidacloprid (Merit) or halofenozide are also options to consider (best results obtained from June or July application). Targeting the grub stage in hope of relief from the adult beetle often leads to disappointment. Be sure to read and follow label instructions on all management tools (traps, nematodes, and insecticides).